On a typical night this semester, the internet connection for Gustavus tends to max out at around 450Mbit/s. But last night was a little different. Last night was election night 2012 ( also a presidential election year ) and a lot of people were getting updates on the elections via the internet. As a result, Gustavus hit a new record high bandwidth mark of just under 700Mbit/s. There was a significant and very noticeable jump from 10:00pm to 11:00pm. I can’t be sure what caused it, but that is about the same time that many networks were predicting who won and it is also the same time that Comedy Central started their live streaming coverage. Gustavus has a 1Gb/s internet connection so we still had bandwidth to spare, but I am curious to hear if anyone had any issues with the network last night. If so, let me know. I did hear that some of the websites that had live stats about the elections were experiencing extremely high load and were unable to handle all the traffic. Another and even more pronounced difference between last night and a typical Tuesday night was the number of people watching live streaming TV using GusTv. Usually any given week night would have maybe five to ten people tuning in at the same time to watch a show. On weekends when football games are going on, and especially when the Minnesota Vikings were playing, we would see a big spike up to 40 or so people watching at the same time. 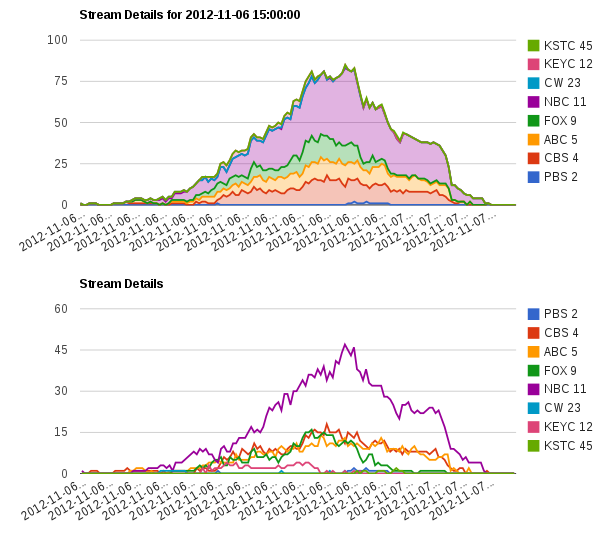 However last night we saw a spike up to about 80 people watching GusTV at the same time. It looks like the most popular network among Gusties was NBC a.k.a. Channel 11 from the Twin Cities. Now I have no way to tell how many people were watching these streams, as the only information I have is how many live streams were being sent out on our network. There could have been 1 computer showing the stream to a classroom full of people for all I know, or maybe one person had their laptop displaying 4 different channels at the same time. Either way, GusTV saw much more usage last night compared to a typical Tuseday night in November. It’s awesome that the students were so engaged and that Gustavus could facilitate that desire to be involved!